Medellin, Columbia is a city with a rich, storied history – it was founded as part of a Spanish colony, and then later became a central part of the global cocaine trade as home to Pablo Escobar’s cartel in the 1980s. Since then, the city has undergone a major revitalization, and although there is still a wide range of economic disparity, it’s become a major center of innovation and culture. 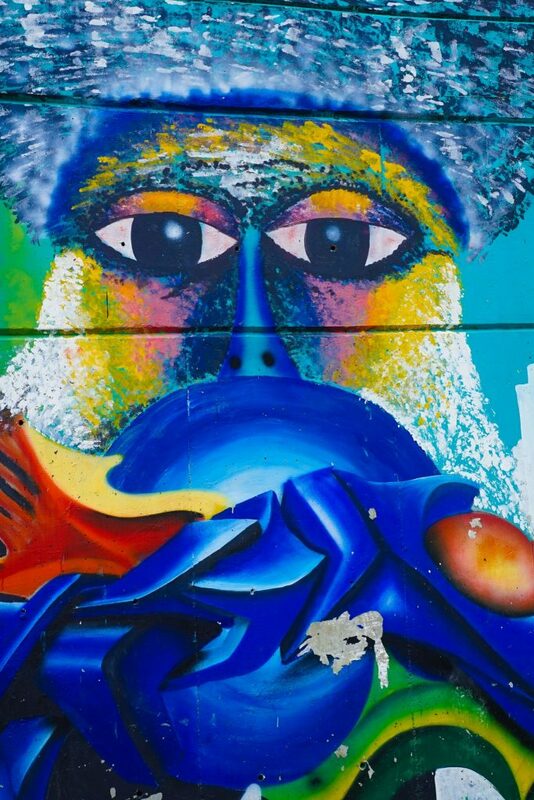 Nowhere is this better exemplified than in the city’s barrios, which have become lively centers of beautiful graffiti and street art. 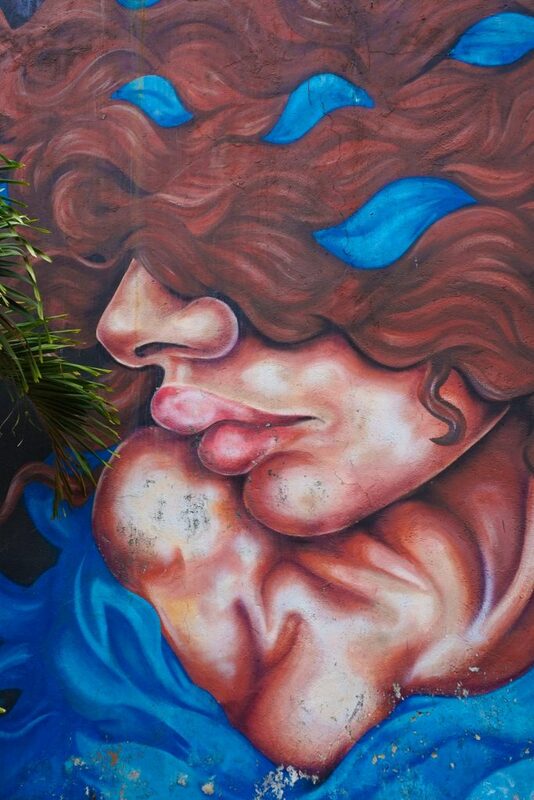 The transformative power of street art has always amazed me. A powerful tool which has the ability to not only modify and invigorate any urban environment but also to instigate significant political and social change. 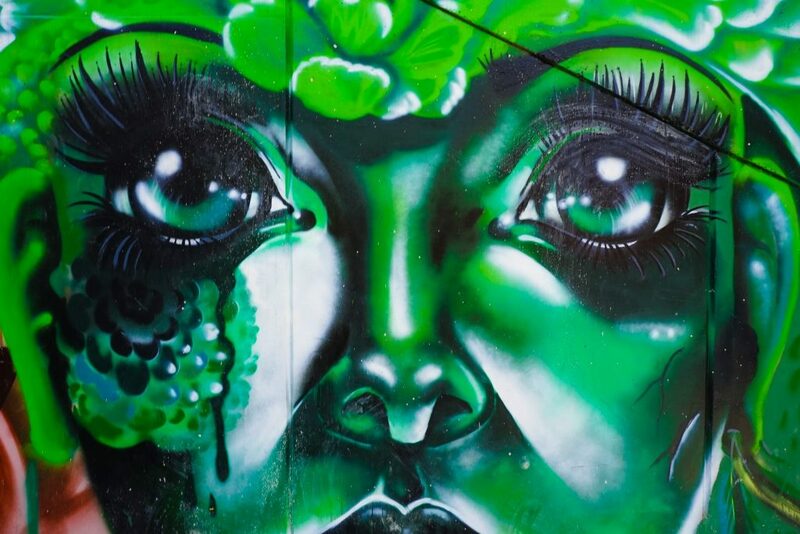 Street art is, at its essence, a form of social media which pre-dates Facebook, Twitter and even the internet itself to get a particular message across, offering insight into the politics of the people well before protestors take to the streets. 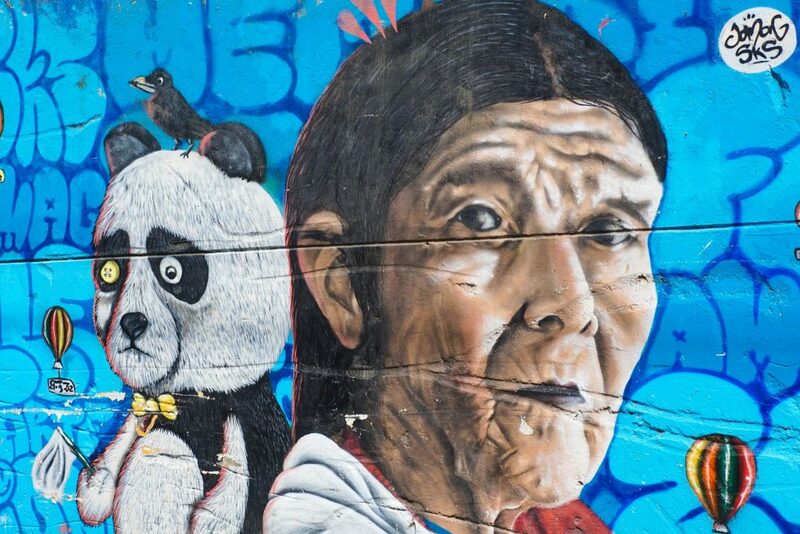 Today street art can be seen in almost every city on Earth – with famous hotspots being Mexico City, Miami, nearby Bogota, and Sao Paulo, but street art’s raw power and potential for change were felt by me most intensively in Medellin’s Comuna 13 – previously one of Colombia’s most dangerous neighborhoods! In fact, Communa 13 was a constant battleground between gangs, narcos, paramilitaries and the government, but today you would hardly recognize it! 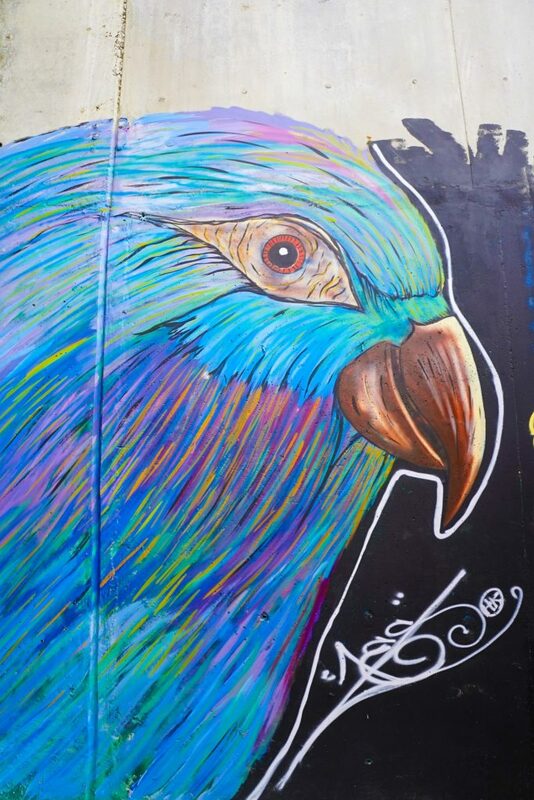 But thanks to street art, what was once Medellin’s most feared barrio’s is now alive with a kaleidoscope of color that diffuses through every house, roof, door and blank canvas in sight. 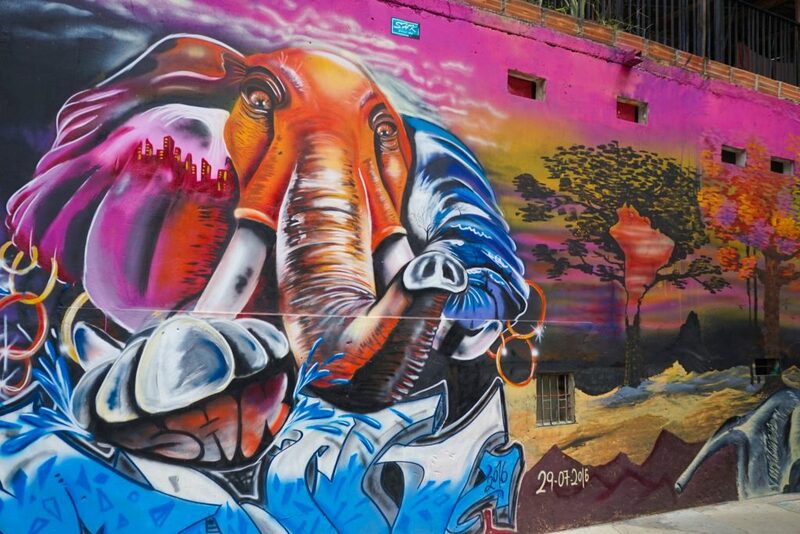 Taking a graffiti tour in Medellin is an absolute must for visitors from around the world. It’s the perfect way to experience the city’s vibrant culture firsthand in a short, accessible tour. Here’s what you can expect and why you need to go. One of the driving factors in Medellin’s transformation is its public transportation system. In addition to the traditional train lines and bus lines that you would expect in a large city, you will also find several aerial cable cars lines throughout the area. 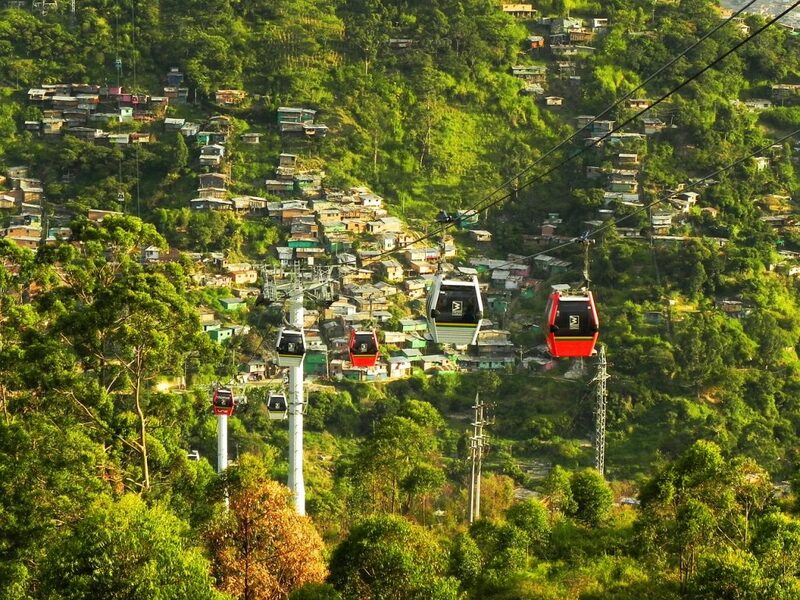 Medellin is very hilly, and so these gondolas are a very efficient way to get from place to place. They also have incredible views and will have you feeling like you’re flying above the city. Your graffiti tour will start with a ride on one of the Metro cable cars, so be sure to bring your camera to document the stunning scenery. 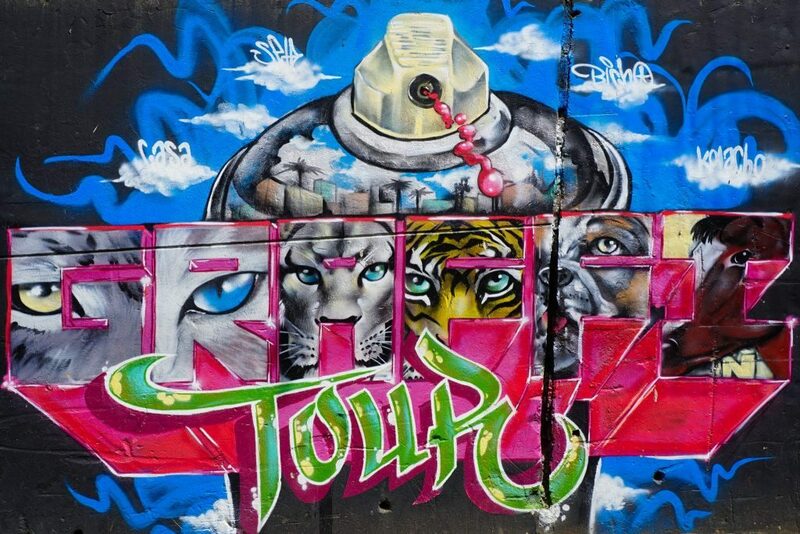 The tour will take you to Comuna 13, a neighborhood on the west side of Medellin that has become known for its graffiti and street art. In the 1990s, this neighborhood was one of the most dangerous in the city, if not the country. It was ridden with violence, drugs, and gang activity, and had an extremely high homicide rate. Residents lived in extreme poverty and feared for their lives. In just a few decades, Comuna 13 has undergone a huge revitalization and is the perfect place to go to experience local culture firsthand. In 2002, the Columbian government undertook a huge operation to displace the rebel groups in the neighborhood. They launched an airstrike where hundreds of residents were wounded. The residents came together to surrender and express their discontent with what had happened. They turned to art to express themselves and started creating beautiful displays throughout the neighborhood. 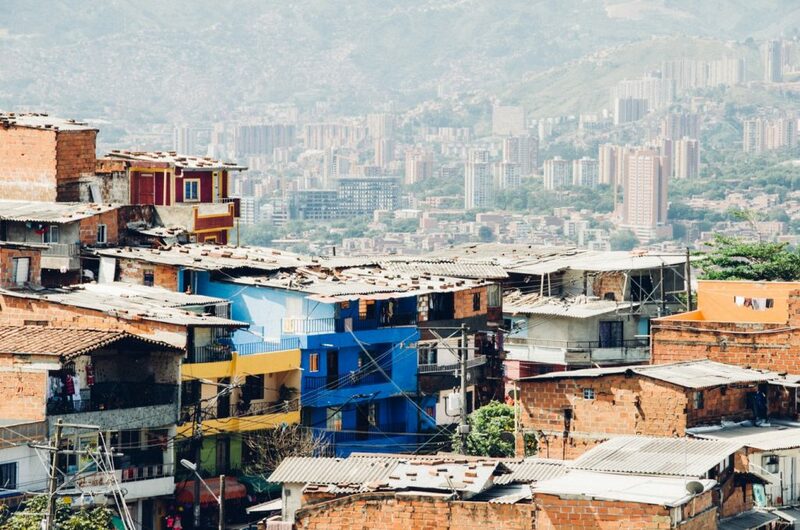 Comuna 13’s metamorphosis now represents Medellin in microcosm: not a perfect model for urban planning by any means, but a radical laboratory where untested experiments are carried out which seek to improve the urban and social fabric. 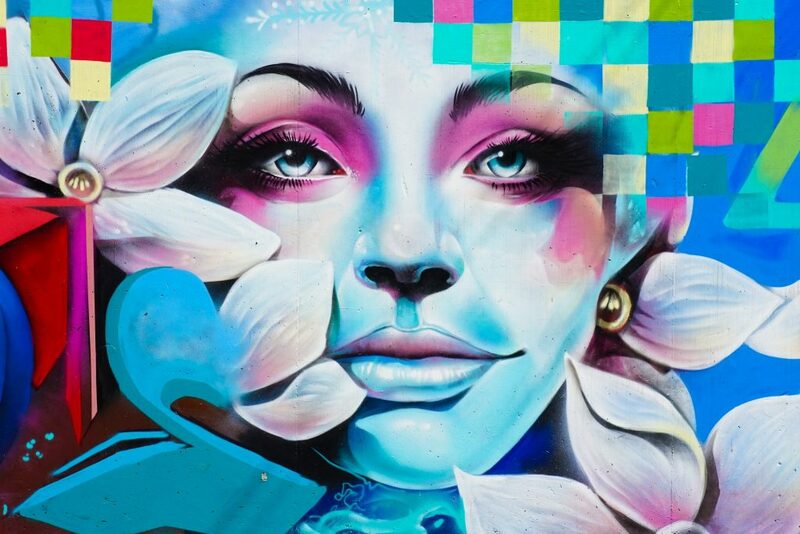 Street art’s themes are as diverse as the people that create them – from being deeply political and serious to being fun, satirical and irreverent, but upon closer inspection of these flaking canvases, you can see they are imbued with hope, the chance for change and ability to dream again. For most of the residents lives here it was impossible to dream, living a life of suffering, terror and unimaginable hardships. Stuck in a cycle of poverty and gang warfare from which there was no way out. Today, however, thanks to the return of the rule of law and many new projects and initiatives in Comuna 13, the people here can again imagine a better life, a safer life. Street art is just one part of this, along with giant public education programs, security, activities for youth, library’s, increased transportation and economic opportunities. 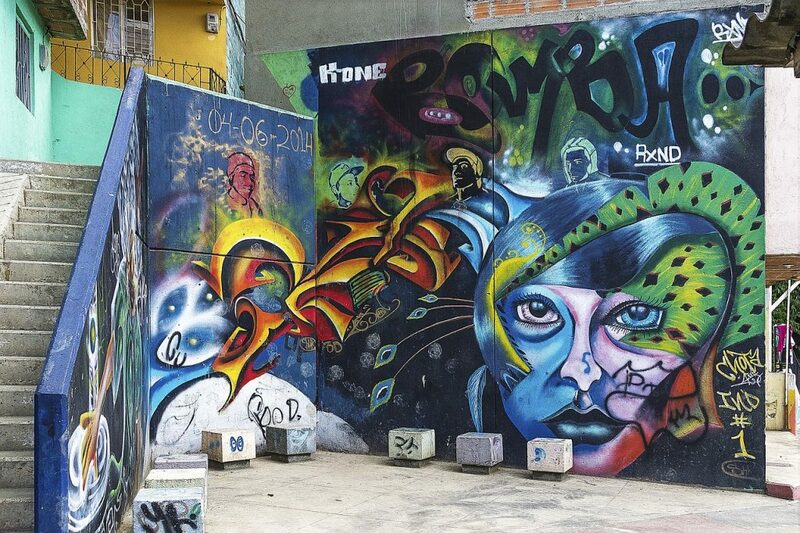 Comuna 13 is also a local center for hip-hop music, and many young artists have come from this area. Although there is still violence in the area, the quality of life has improved drastically for residents. There is a sense of community, and visitors are working together to make it a better place to live. We can expect to see even more positive change over the next few decades as the neighborhood continues on its positive trajectory. 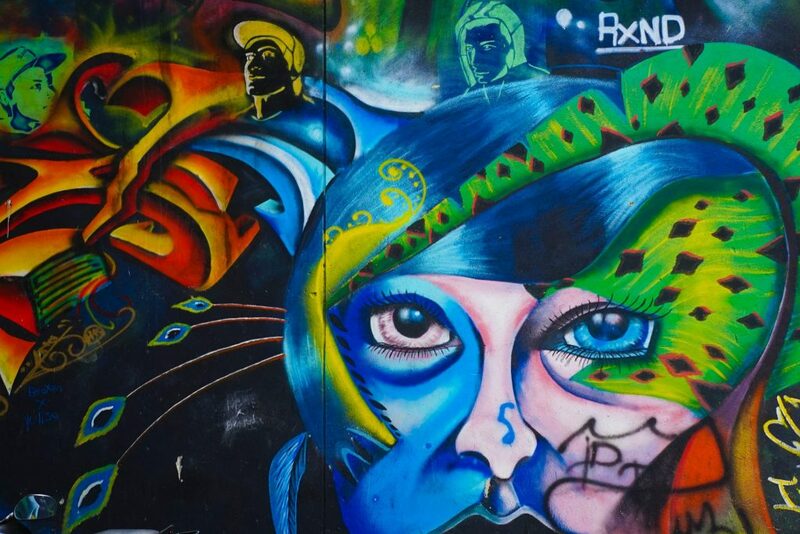 To feel the energy of street art is really one of the best things to do in Medellin. The art’s ability to re-imagine and re-energize an urban space which was otherwise lacking is on full display. No style, rules or conventions seems to apply to the canvases. 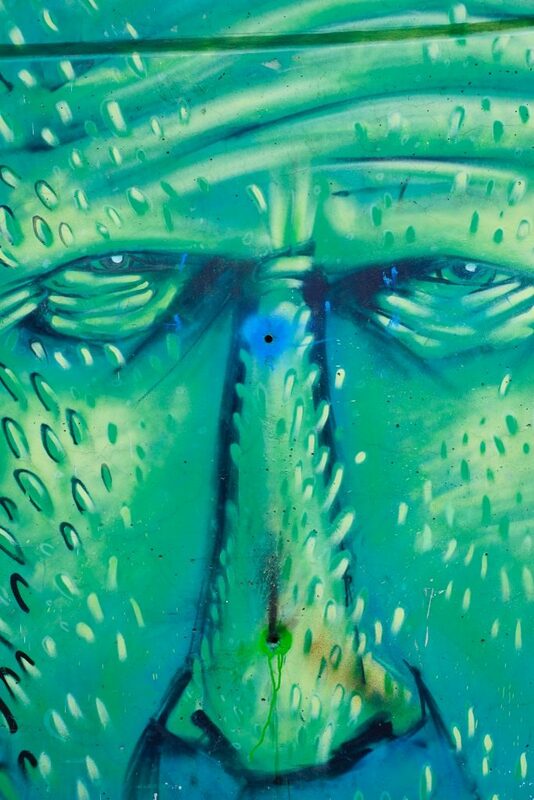 In this way Street Art is still very much ‘art’ and as such can be figurative, abstractionist, text-based – you name it. However, one common denominator becomes obvious after you have spent any time here: color! Everywhere you gaze the generic red bricks and grey walls which dominate Medellín are transformed into a color explosion. What once was a drab and uneasy space is suddenly fun, vivid and inviting. 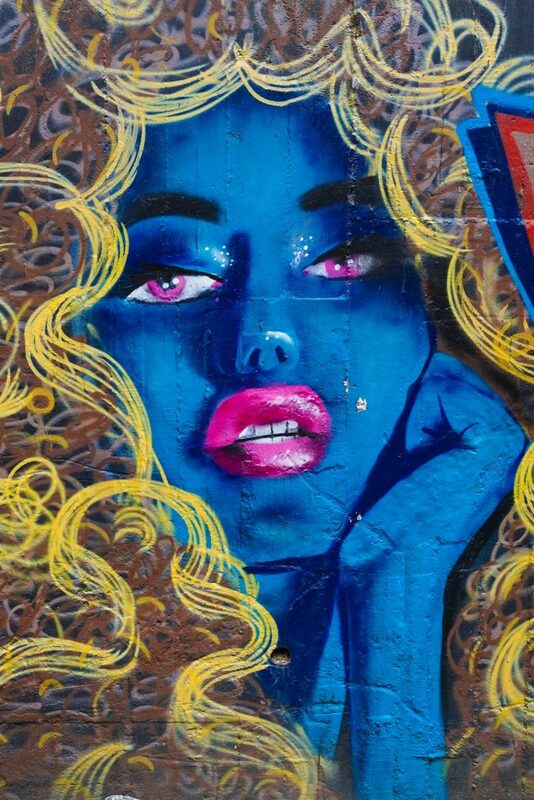 You feel the need to linger, to examine and attribute meaning – if nothing else street art has transformed this into a place where people slow down, consider and take solace in the small pleasures on offer. 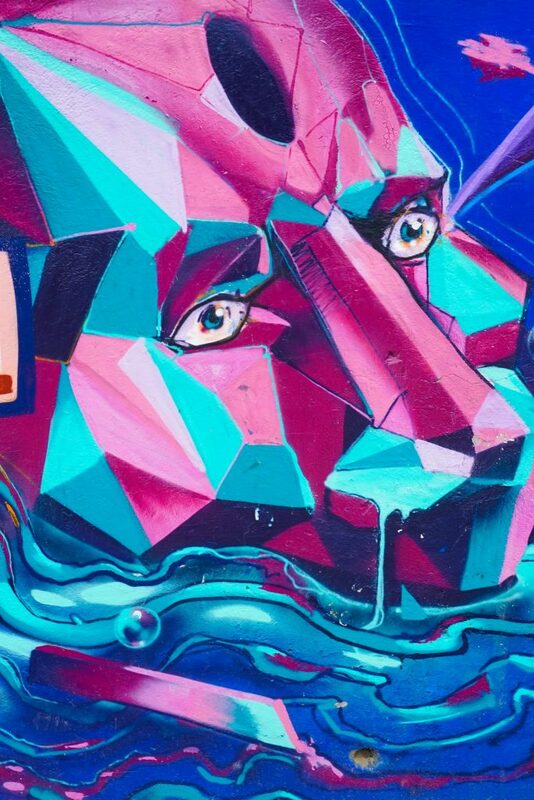 On your tour, your guide will take you through this beautiful, vibrant neighborhood and show you the most notable pieces of graffiti. They will also recommend street vendors where you can try flavorful authentic Columbian food and shop for local handmade goods. You’ll also see the neighborhood’s iconic orange escalators, which are giant and help residents get up and down the hill. 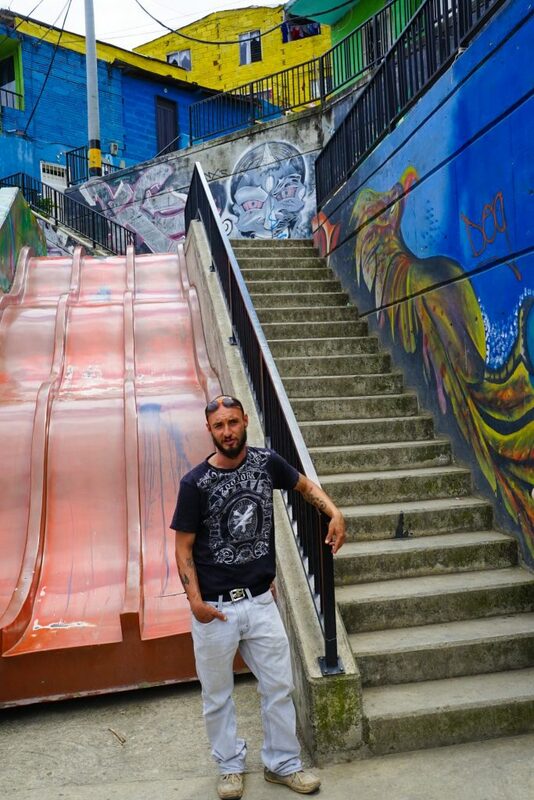 The escalators transformed the way Comuna 13 residents connected with the rest of the city. The tour is a very safe and efficient way to explore the neighborhood because you will be led by a local guide that is very familiar with the area. They know the residents and the culture, and they’ll help you experience the neighborhood in a way you wouldn’t be able to on your own. Although Medellin is getting safer, many tourists still have concerns about the safety levels of the area. 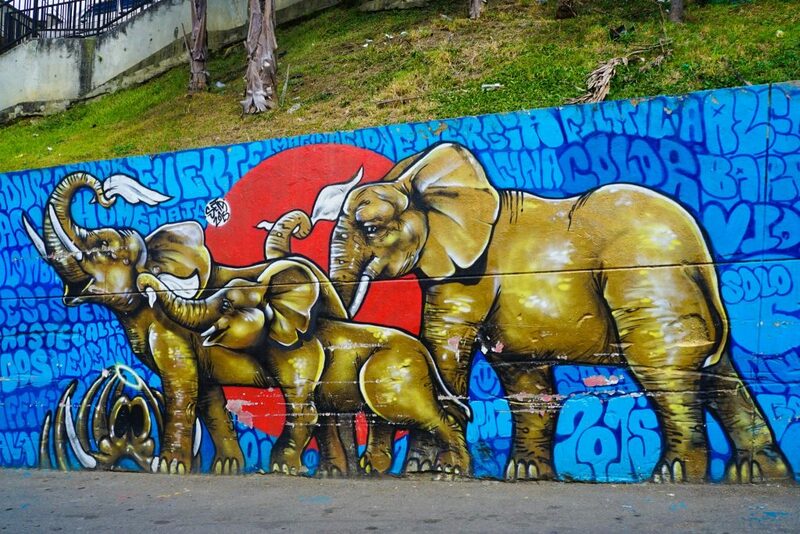 Medellin graffiti tours take precautions to make sure you feel safe and comfortable throughout your visit. They’ll pick you up from your lodging and take you directly to the Metro cable car, and they’ll help you navigate through the neighborhood. 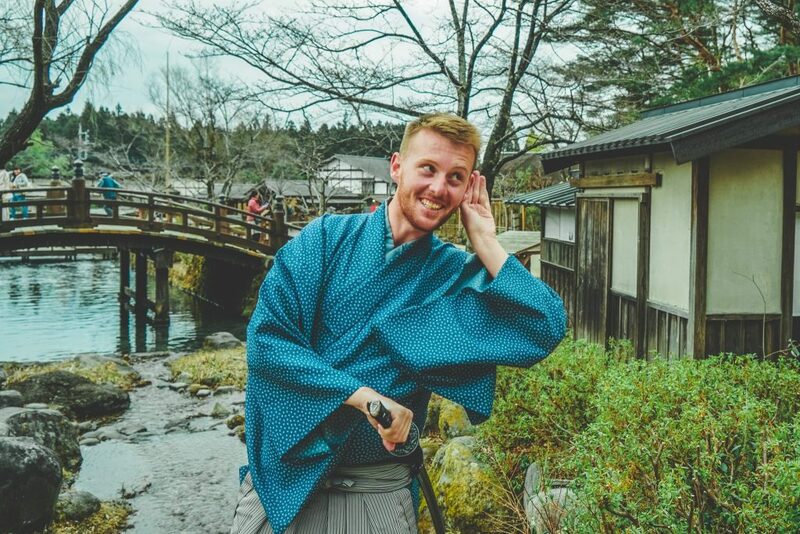 Navigating the city in a group is the best way to experience the culture safely and comfortably, and go out of your comfort zone in a way that is very beneficial. To be clear, however, this is a very safe neighborhood – It is one of the greatest tourist attractions in Colombia after all. Its peaceful streets are as safe as the tourist strong-hold of El Poblado but you are afforded here an opportunity to see the real Medellin and interact with its locals. Mass tourism has still not exploded here so you can wander in peace, practicing your Spanish with residents of the community who are excited and welcoming of anyone who dares to visit after many years of violence. I enjoyed musing of the intentions behind the artists’ choices, deliberate or otherwise, and marveling at the change it had brought to this area. Medellin is an incredible destination that you can’t miss while visiting South America. It has a unique culture that differentiates it from other cities in Columbia. 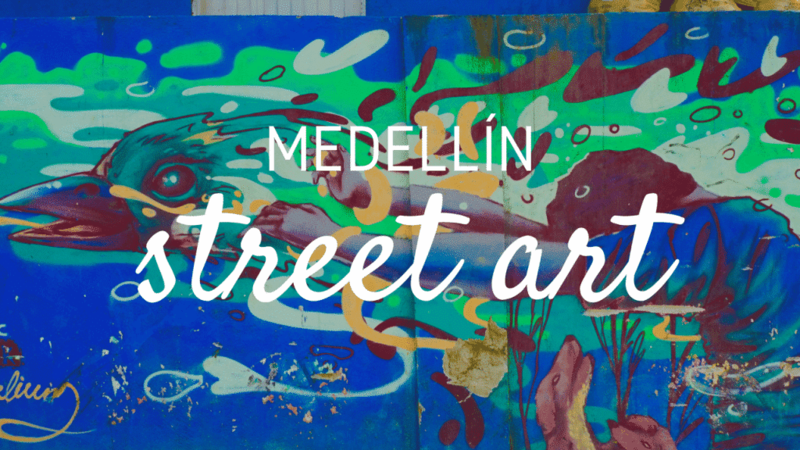 Here are some tips to help you make the most of your trip to Medellin. Take advantage of the city’s incredible public transportation. Medellin has made incredible investments in their train and cable car lines, and you will be able to get almost anywhere you need to go by using them. The metro is very affordable, and you can save quite a bit of money by using it instead of cabs whenever you can. Dress formally when going out for food or drinks. The hot weather often fools visitors into thinking they can wear shorts and flip-flops everywhere, but locals tend to dress up a little more. You don’t have to wear a tux or an evening gown, but wear long pants and a nicer shirt when you’re going out at night. 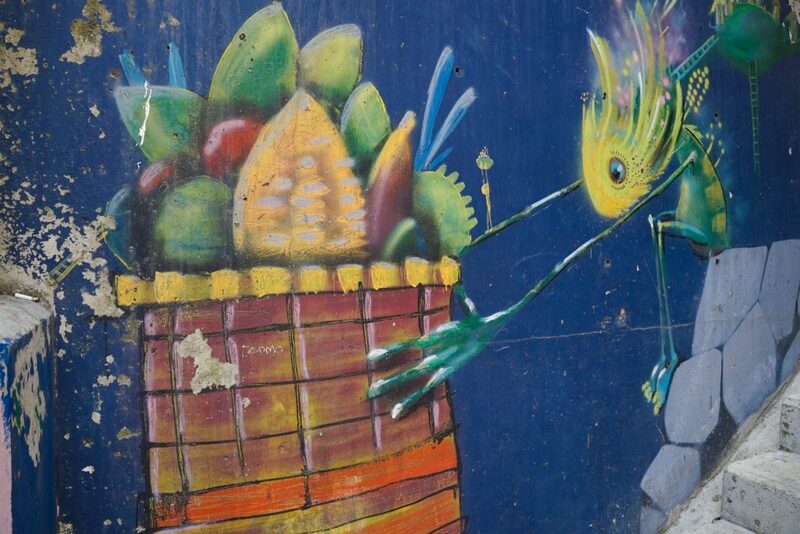 Although Medellin is much safer than it used to be, visitors still need to be careful when exploring the area. Keep your valuables locked up in your hotel room, and opt for guided tours when you can until you are more familiar with the city. Be prepared to socialize with locals. Unlike residents of many other cities, Medellin locals love to chat and are very friendly. Don’t be put off by this – it’s actually the perfect opportunity to experience the local culture. Use your best judgement, but don’t be afraid to chat with a local street vendor, because they’ll likely give you great travel tips or memorable stories. Locals are proud of their city, so it’s best to avoid talking about the drug cartels and Pablo Escobar – stick to more positive topics. 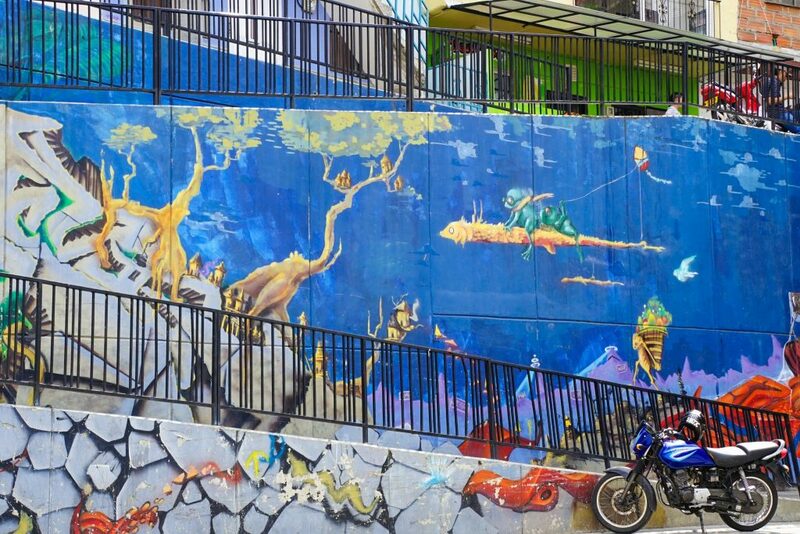 Comuna 13 is now an internationally renown example of urban transformation, an innovative approach to community revitalisation: a not to be missed attraction in Medellín and Colombia. From its outdoor electric escalators to it’s small mom-and-pop stores, Medellín is open to explorers who can overcome their pre-conceptions and choose to wander its streets. 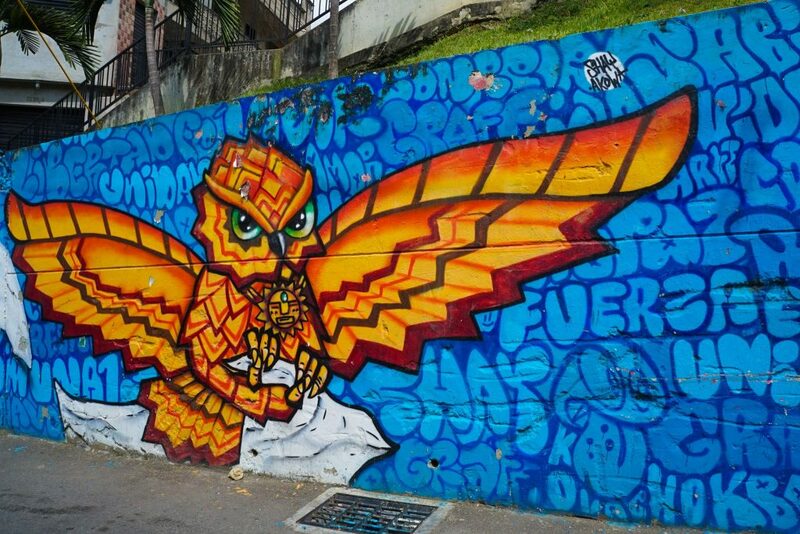 Comuna 13 is no longer the most feared corner of the city but instead, it’s most colourful, a barrio with a bright future mirroring that of Medellin and Colombia! 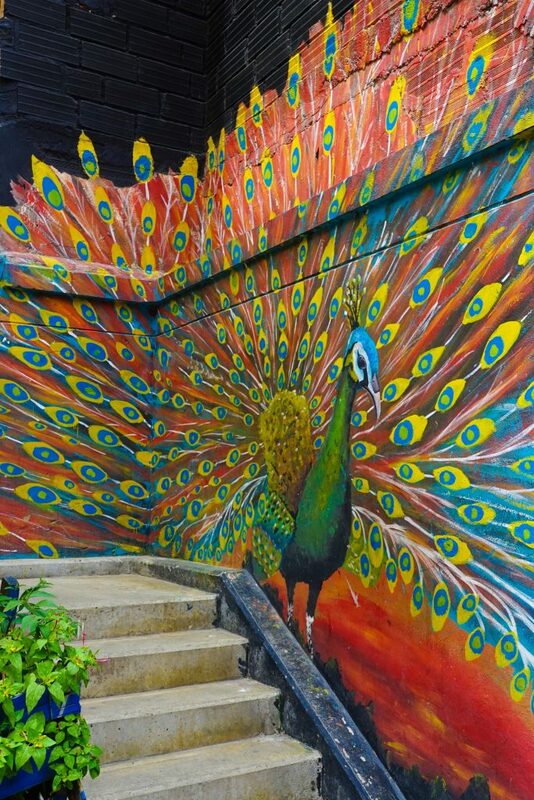 Don’t miss the incredibly vibrant culture of Medellin on your trip to Columbia. 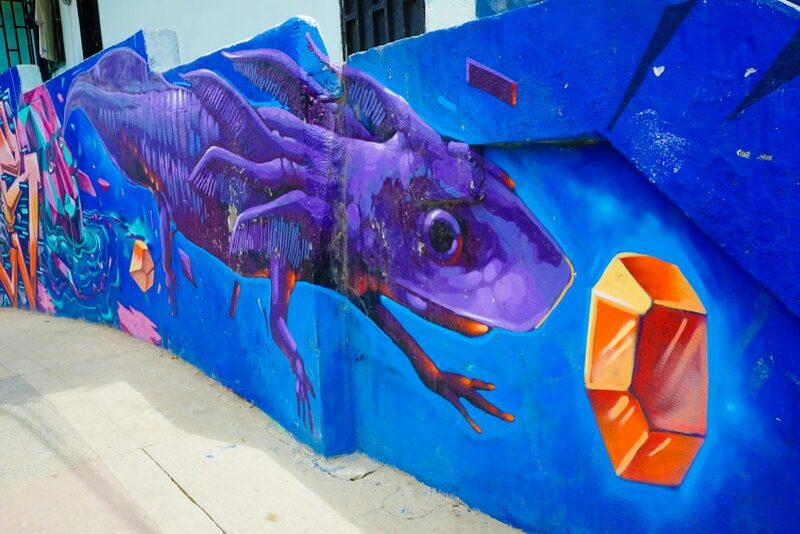 The incredible art, music, and friendly locals make it a trip you won’t forget. 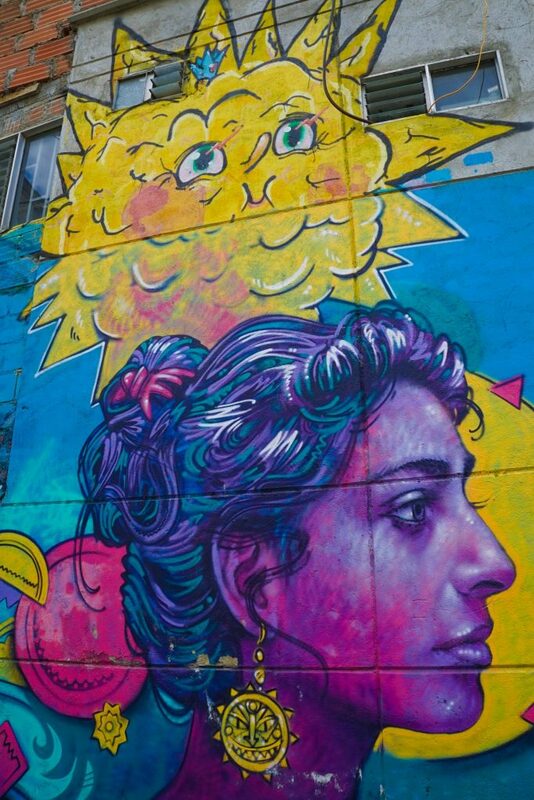 Sign up for a graffiti tour before you go to make sure you get an authentic local experience.